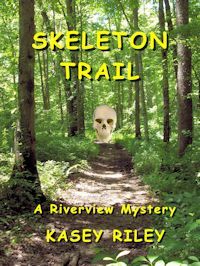 Trail riders Bethany and Megan stumble upon a mummified body when setting up a new trail in a National Forest. This brings FBI forensic specialist David Harrison to remote Riverview, Colorado where Megan and Kam lead him to the corpse. Surprised by the women’s strength and independence, he realizes they need him for his forensic skills only. They could have brought the body out without his help. Bullets and a blizzard force Kam and David to an abandoned cabin. There, they discover links from the murder to extortion and blackmail from the 1930’s. The harrowing experience brings them closer, each learning the strengths of the other. Together with Megan and Aaron, Kam and David discover the connections of the cold crime to crimes of the past and the present. Danger, pain and a murder attempt against Kam makes David realize how much her safety means to him. Secrets of her past drive Kam away from the small rural town of Riverview, Colorado. Even knowing the people stand together against danger and the unforgiving land, can Kam dare to trust them to stand behind her? This book, like the first Riverview mystery, Desperate Endurance, shows the values and cohesiveness of small town and rural America. People are willing to help each other and work to keep each other safe in a very rugged and unforgiving land.